2 How to grow coffee? To date, the coffee produced in 70 countries of the world, Brazil ranks first, then Vietnam, Colombia and Indonesia. Grow coffee in Asia and Africa, America, Oceania, Today more 100 regions of the world are engaged in coffee. Total produced about 6-8 million tons. coffee per year. As far as coffee is an important product for mankind, eloquently confirms the fact, that the turnover of coffee is second only to oil. 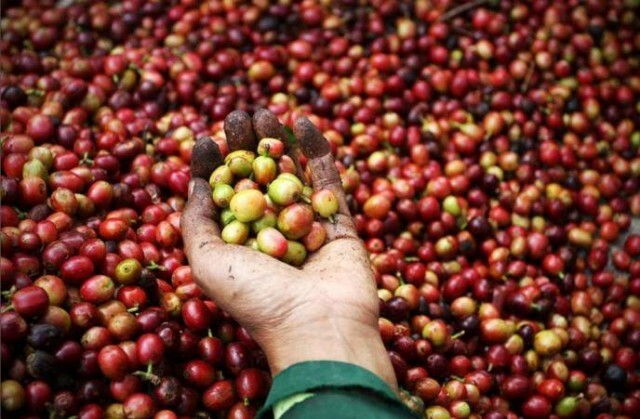 Coffee beans - the seeds of coffee cherries. there are up to 100 types of coffee trees, but only three kultivirut. The most widespread is the Arabian coffee tree (Coffea arabica), then Congolese or Robusta (Coffea canephora) and liberika (Coffea Liberica), percentage of its distribution is very small. Coffee tree likes moist and warm climate of the tropics, principal place of coffee plantations of the world is called "coffee belt of the Earth", it includes tropical and equatorial zones. It is believed, that were planted all over the world 6 billion. trees, holding up 4,5 million. hectares. Grow at any altitude, from sea level, to highlands, to mark up 2000 m.
Grow trees on small and large coffee plantations. Since the nature of the trees can grow up to 6-10 m in height, they have to be periodically trimmed to 2-3 m, forming small bushes for easier harvesting. How heatwave, and cold detrimental effect on plants, they prefer light shade, friable, fertile ground, adequate lighting, rainfall rainy season, stable temperature and humidity. Often plantation cased perimeter higher trees, to create shading, because the trees do not tolerate direct sunlight and overheating. Arabica coffee trees more capricious, prefers special growing conditions, plantation in the mountains, at an altitude of 850 m above sea level, with plodorodnыmi pochvami, mild climate and abundant rainfall. Robusta neprihotliva, easier to tolerate temperature fluctuations and heat, less damaged by disease, and parasites, rising sea level height. But on 2/3 World plantations prefer to grow arabica, because it far exceeds the quality grade Robusta. Robusta more robust due to the higher caffeine content, but has a low aromatics content as compared to Arabica. Robusta used for the production of soluble coffee and added to the variety of coffees combined with Arabica, eg, espresso coffee, to obtain a stable and dense foam and increase the fortress. after planting,, young trees begin to bear fruit through 3-4 of the year, but the technical maturity comes even later 2-3 of the year, they are to bear fruit 30 years old. Blooming these amazing trees are very beautiful, covered with cascades of white flowers, like little stars with a pleasant smell. after about 6-10 months ripen fruits. they ripen unevenly, per plant can be seen and bright red - matured, and yellow - ripening, and green, still unripe fruits. Choice of coffee is made only from fully ripe fruit of elite varieties of Arabica, but some coffee robusta and arabica varieties harvested regardless of their maturation, Therefore, in the finished form, it consists of a heterogeneous maturity of fruit. Harvesting takes place at a time of low grade coffee, and for high-grade - within 2 weeks, when gradually removed only ripe fruit and the rest are waiting for the full maturation of fruits. This time-consuming process, since the collection of the fruits takes place manually, and only on large plantations in Brazil rarely used kofeuborochnye machines. After harvesting, proceed to their treatment, the result must be liberated from the pulp shells and coffee bean. Processing is dry and wet. 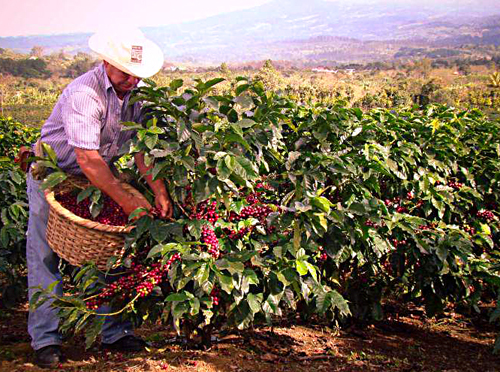 collected the fruits of coffee scattered on the sun, on level ground, follow, to layer thickness was small. Occasionally they are mixed, preventing decay, sheltering at night from the damp. Through 2 the pulp dries week, and coffee beans are exempt from it. Often the fruit just hang on the tree, falling upon drying on a cloth spread out at the bottom. For processing and use artificial drying, if the sun is not enough. It is used for processing high-quality coffee only. 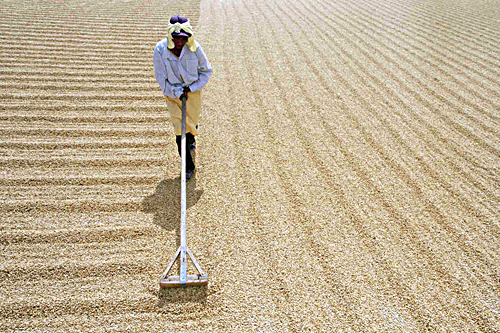 Carefully cleans the grain, but it will require considerable quantities of water, which is very expensive for many coffee-producing countries. In this method,, ripe fruit exactly the same maturity undergo primary treatment using special mills, remaining as a result of only a thin shell. Further, the grain is supplied to the washing, where it damaged grain floats and sifted. It begins the fermentation process: grain enters into a large container of water, which can be up to one day, with frequent stirring. During this time, the mucus, which covers the grain, destroyed, they are once again washed with water, then dried up 11% humidity, no less and no more, which it is very important for the quality of. The dried grains sorted after treatment, then packed in jute bags special. Normally, the green beans are stored, depending on the variety, from one year to 8 years old. other varieties of taste may even improve over time. Coffee-producing countries are engaged in the cultivation and processing of coffee, and roasting, ix crush, mixtures drafting, production of other types of coffee - given to a greater extent in the consumer countries, who make up this 100% and above the initial cost of raw grain.